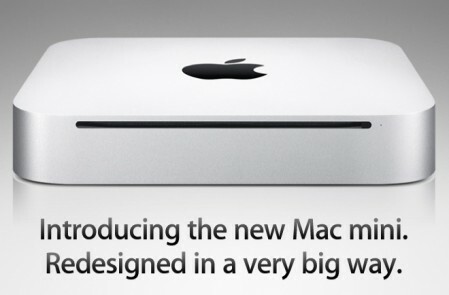 Apple has changed the design of the Mac mini, it’s now smaller, includes HDMI port and SD card slot. CUPERTINO, Californiaâ€”June 15, 2010â€”AppleÂ® today unveiled a completely redesigned MacÂ® mini, featuring up to twice the graphics performance, a new HDMI port and a new SD card slot, all in an amazingly compact aluminum enclosure. Mac mini is the worldâ€™s most energy efficient desktop and starting at $699, is the most affordable way to enjoy Mac OSÂ® X, iLifeÂ® or Mac OS X Snow LeopardÂ® Server. With twice the graphics performance, the new Mac mini is still the worldâ€™s most energy efficient desktop. * The new Mac mini reduces power consumption by an incredible 25 percent to less than 10W at idle, less than half the power required by competing systems. Mac mini meets Energy Star 5.0 requirements and achieves EPEAT Gold status. ** The new aluminum enclosure is highly recyclable and Mac mini uses PVC-free components and cables, contains no brominated flame retardants and features material-efficient system and packaging designs. Mac mini comes with Mac OS X Snow Leopard, the worldâ€™s most advanced operating system, and iLife, Appleâ€™s innovative suite of applications for managing photos, making movies and creating and learning to play music. Snow Leopard builds on a decade of OS X innovation and success with hundreds of refinements, new core technologies and out of the box support for Microsoft Exchange. iLife features iPhotoÂ®, to easily organize and manage photos; iMovieÂ® with powerful easy-to-use new features such as Precision Editor, video stabilization and advanced drag and drop; and GarageBandÂ® which introduces a whole new way to help you learn to play piano and guitar. Mac mini with Mac OS X Snow Leopard Server fulfills all the server needs of a workgroup or small business including email, calendar, file serving, Time MachineÂ® backup, Wiki Server, Podcast Producer and more. Mac mini with Mac OS X Snow Leopard Server uses less than 11W of power at idle, a fraction of the power consumed in comparison to typical entry-level tower servers. *** Mac mini with Mac OS X Snow Leopard Server is faster than before with a 2.66 GHz Intel Core 2 Duo processor, two 500GB hard drives now running at 7200 rpm, 4GB of RAM and supports unlimited clients for $999. The new Mac mini is shipping today and will be available through the Apple StoreÂ® (www.apple.com), Appleâ€™s retail stores and Apple Authorized Resellers. Build-to-order options and accessories include up to 8GB 1066 MHz DDR3 SDRAM, 500GB hard drive running at 5400 rpm, Apple Remote, Apertureâ„¢ 3, Final CutÂ® Express 4, LogicÂ® Express, iWorkÂ® (pre-installed), Apple Wireless Keyboard, Magic Mouse, Apple 24 inch LED Cinema Display and the AppleCareÂ® Protection Plan. iTechia is selling mac mini now? How much is the 2.4GHZ?